As our population continues to age, it is estimated that more than 20% of Canadians will have a disability by 2036. Odds are that you, the reader, have experienced, will experience or currently experience a disability. 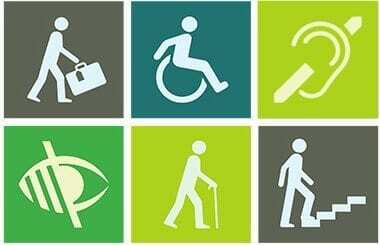 Disabilities can be physical, emotional or cognitive. They can be visible or invisible, short term, long term or even episodic. The impact of a disability can vary greatly, from being mild to severe. In general, no two individuals experience the same disability in the same way. In fact, the same individual may very well experience a disability differently at different times throughout his or her life. The latest MaRS Market Insights white paper, Towards an Accessible Future: Ontario Innovators in Accessibility and Universal Design, explores accessibility and design, and how innovators are making Ontario more accessible. The paper is now available to download. This topic is of special interest to me, as disability is part of the human condition: almost everyone will be either temporarily or permanently affected by a disability at some point during his or her life. For me, it was a soccer injury over a decade ago that left me with the actualization that I was not invincible and had me yearning for a more accessible environment as I navigated a university campus with crutches. Ontario took action in 2005 with the passing of the Accessibility for Ontarians with Disabilities Act with the goal of creating an inclusive society where everyone can participate to his or her full potential. The act called on the province to become fully accessible by 2025, creating a level playing field for all Ontarians. 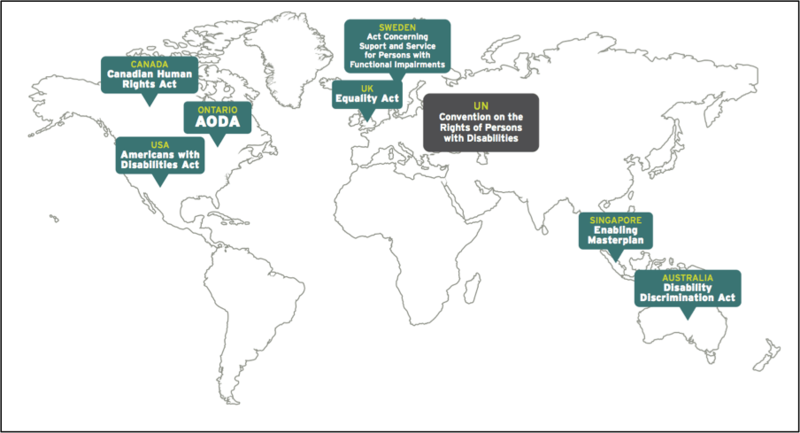 This made Ontario one of the first jurisdictions in the world to implement proactive, enforceable, compliance-based accessibility legislation. Making Ontario accessible and creating innovative solutions to enhance accessibility is not only the right thing to do, it is also the smart thing to do. 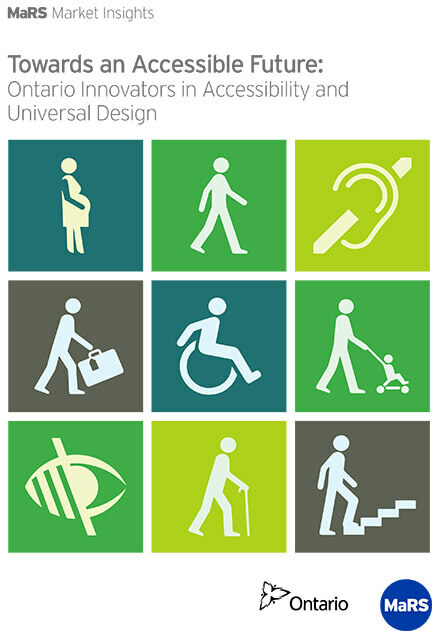 Adopting the principles of universal design during product development not only helps those who need help the most (that is, people with disabilities), but it can also make life easier for every citizen in the province. It’s a multi-billion-dollar market opportunity. Ontario startups and research institutes are taking this market seriously. In the Market Insights white paper, you will read about a handful of these innovators: who they are, what they’re doing and why they’re doing it. 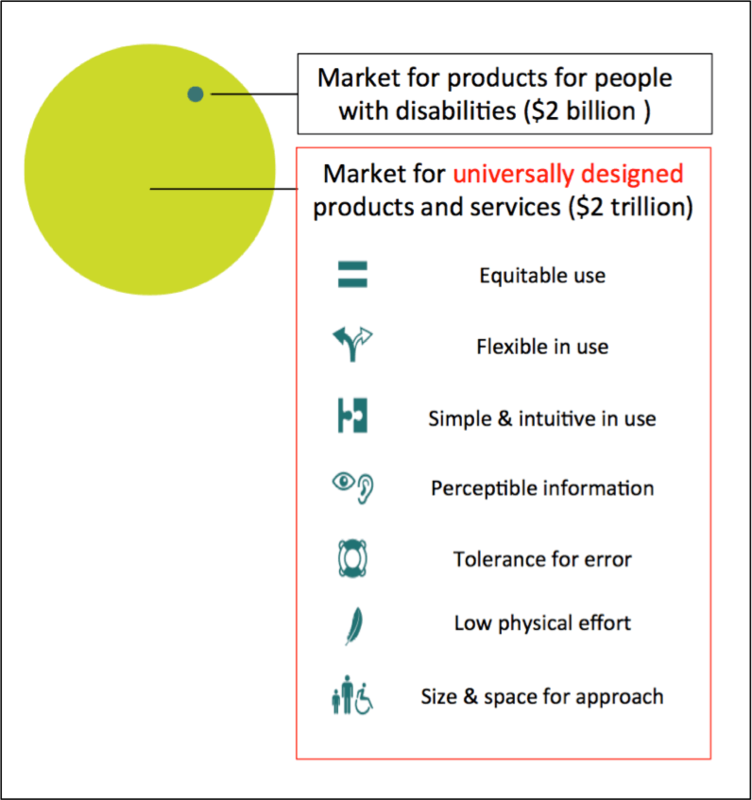 Developing products using principles of universal design is not only the right thing to do, it is the smart thing to do—economically. Join us at MaRS on January 16 as we host a panel discussion on the topic, moderated by Glen Padassery, director of the Accessibility Directorate of Ontario’s Standards, Policy and Compliance Branch in the Ministry of Economic Development, Trade and Employment. Panel members will consist of Chris Wiegand, CEO of Jibestream; Professor Jutta Treviranus, director of the Inclusive Design Research Centre and Inclusive Design Institute at OCAD University; and Joel Dembe, Paralympic athlete and Canadian National Wheelchair Tennis Champion. The event will be fully accessible and will be live captioned. Register and read more about the event here.